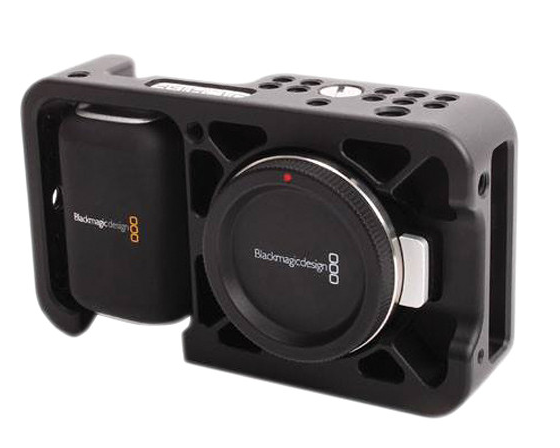 Improve your Blackmagic Pocket Camera with a cage. 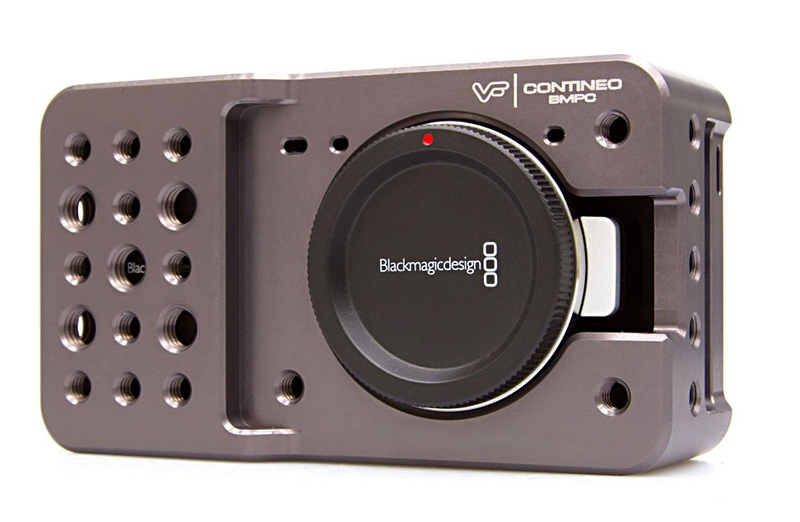 In this post, we share 5 solid options to outfit your new BMPCC. So you’re considering buying a Blackmagic Pocket Cinema Camera? You will need some support gear to get the most out of your investment. 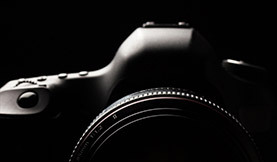 Cages are exoskeletons that will provide some protection for your camera, as well as a way to attach accessories to it. The basic cages start at $100 and the most expensive full kits with accessories top out around $1000. All the rigs below are available from the respective manufacturers websites. B & H also carries all of the models below except for ViewFactor. 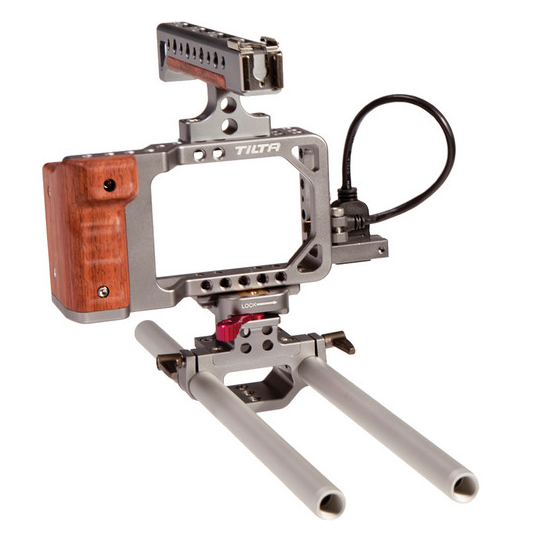 Wooden Camera is based in the USA and offers a 1 year warranty. Their cage offers a minimal, very lightweight rig (4.8 oz) with 1/4-20 and 3/8-16 holes for mounting. The basic cage (above) sells for $99. You can choose from 2 kits, as well as adding the Pocket Lock HDMI ($40) or Pocket Lock Power ($30). 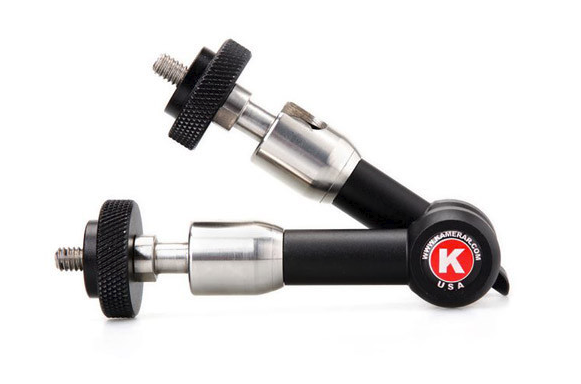 The Fixed Kit ($688) includes the Pocket 15mm Base, Top Cheese Handle (1/4-20 and 3/8-16 holes for mounting) A-Box (XLR Audio Adapter) and 2 (12″) 15mm rods. The Quick Kit ($988) adds a quick release plate so you can quickly go from “studio mode to handheld mode”. Wooden Camera has a solid reputation for making reliable gear for professionals. All of the available Wooden Camera gear has videos on how to use it. This is helpful, as you get a sense of what the gear is designed to do before you buy it. 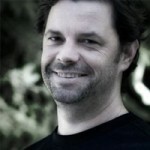 ViewFactor is based in the USA and offers a 1 year warranty. The Contineo™ BMPC Cage is built like a tank, reasonably light (9.5oz), and probably has more 1/4-20 and 3/8-16 mounting options than you will ever need. The basic cage sells for $100. If you want to add rods, an additional kit option is the best way to go ($250). They don’t currently offer a handle for the top of the cage or rods, but they do offer a Wood Grip /Ultra Grip ($40), as well as a HDMI and Power Clamp Bracket. Additionally, you can personalize your gear with laser name etching or laser logo etching for an additional fee, $15 and $35 respectively. 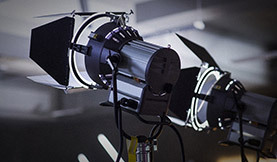 The ViewFactor blog offers photos and details on their recent products. SHAPE is based in Canada and offers a 1 year warranty, as well as a lifetime warranty on parts made by SHAPE. D Focus System is based in the USA. 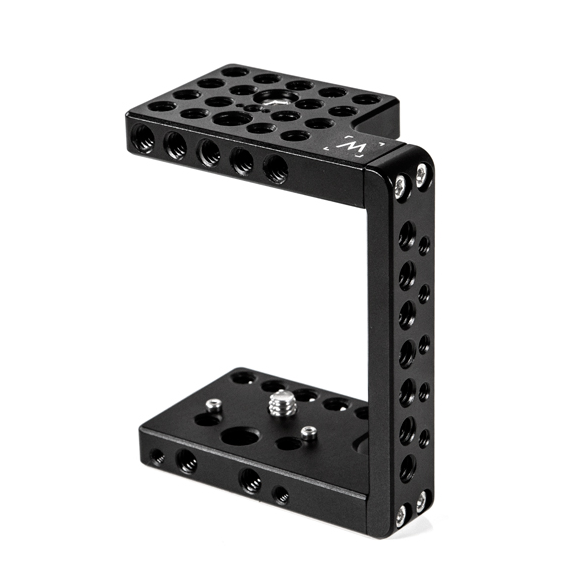 Their cage is light (7.8oz) with 1/4-20 and 3/8-16 mounting holes, and features a HDMI cable clamp. The current price for the cage is $169.95. D Focus makes other camera gear (rods, matte box) but doesn’t offer other gear specifically for the BMPCC. Tilta is based in China, but it is distributed by Ikan and also available on eBay. When purchased from Ikan it has a one year warranty. 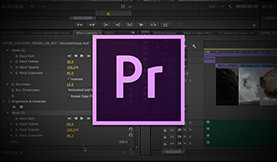 The rig currently sells retail for $359. 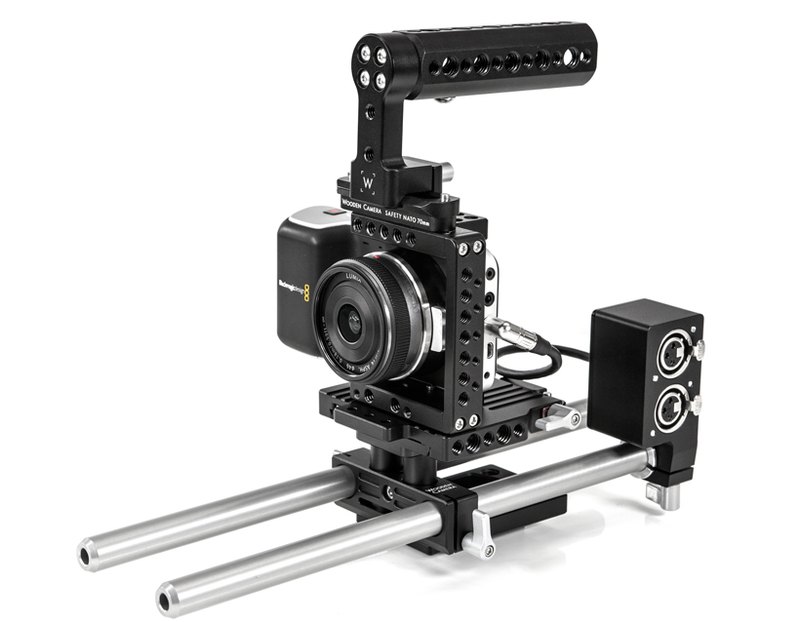 They offer a rig (2 pounds) with top handle, quick release plate, 15mm rods, Micro HDMI to HDMI adapter cable/mount and 1/4″-20 holes for mounting. Use friction arms to mount various gear (monitors, lights, audio recorders, mic) to your cage. PNC sells a 7″ and 11″ Friction Arms and the more heavy duty KAMERAR ‘TOUGH’ Friction Magic Arms in 7″ and 11″. Got some Blackmagic Pocket Cinema Camera gear to recommend? Share your tips and fave products in the comments below!